Definition at line 299 of file DeclCXX.h. Iterator that traverses the base classes of a class. Definition at line 725 of file DeclCXX.h. Definition at line 820 of file DeclCXX.h. Definition at line 722 of file DeclCXX.h. Definition at line 818 of file DeclCXX.h. Function type used by lookupInBases() to determine whether a specific base class subobject matches the lookup criteria. Specifier the base-class specifier that describes the inheritance from the base class we are trying to match. Path the current path, from the most-derived class down to the base named by the Specifier. true if this base matched the search criteria, false otherwise. Definition at line 1747 of file DeclCXX.h. Definition at line 1244 of file DeclCXX.h. Definition at line 1245 of file DeclCXX.h. Definition at line 1260 of file DeclCXX.h. Iterator access to constructor members. Definition at line 880 of file DeclCXX.h. Definition at line 882 of file DeclCXX.h. Function type used by forallBases() as a callback. Definition at line 1717 of file DeclCXX.h. Definition at line 897 of file DeclCXX.h. Iterator access to method members. The method iterator visits all method members of the class, including non-instance methods, special methods, etc. Definition at line 860 of file DeclCXX.h. Definition at line 862 of file DeclCXX.h. Definition at line 115 of file DeclCXX.cpp. Referenced by Create(), CreateDeserialized(), and CreateLambda(). Determine whether declaring a const variable with this type is ok per core issue 253. Definition at line 1502 of file DeclCXX.h. Definition at line 822 of file DeclCXX.h. Referenced by addAssociatedClassesAndNamespaces(), addBaseAndFieldSizes(), clang::ODRHash::AddCXXRecordDecl(), AddIndirectPrimaryBases(), clang::Sema::checkIllFormedTrivialABIStruct(), checkMoveAssignmentForRepeatedMove(), collectPublicBases(), ComputeVMIClassTypeInfoFlags(), defaultedSpecialMemberIsConstexpr(), clang::Sema::DefineImplicitCopyAssignment(), clang::Sema::DefineImplicitMoveAssignment(), clang::Sema::DefineInheritingConstructor(), DiagnoseBaseOrMemInitializerOrder(), DiagnoseUninitializedReference(), diagnoseUnreadableFields(), dllExportImportClassTemplateSpecialization(), clang::CodeGen::CodeGenFunction::EnterDtorCleanups(), FindBaseInitializer(), findDirectBaseWithType(), forallBases(), clang::CXXMethodDecl::getCorrespondingMethodInClass(), clang::CodeGen::CodeGenModule::getMostBaseClasses(), getTypeInfoVTable(), clang::CodeGen::CodeGenFunction::getVTablePointers(), hasFields(), hasRepeatedBaseClass(), HasTrivialDestructorBody(), clang::if(), clang::Sema::inferCUDATargetForImplicitSpecialMember(), isAnyDestructorNoReturn(), clang::NestedNameSpecifier::isDependent(), IsDerivedFromInclusive(), isDirectVBase(), clang::Sema::isEmptyCudaDestructor(), isFunctionLocalClass(), isImmediateBase(), IsPartOfAST(), isReadByLvalueToRvalueConversion(), isValidBaseClass(), isVirtualDirectBase(), clang::Sema::LookupInSuper(), clang::Sema::MarkVirtualMembersReferenced(), mayBeAbstract(), clang::OverridingMethods::replaceAll(), RequiresVtordisp(), serializeClassHierarchy(), clang::Sema::SubstBaseSpecifiers(), clang::CodeGen::CodeGenModule::TryEmitBaseDestructorAsAlias(), clang::TextNodeDumper::VisitCXXRecordDecl(), and clang::VTTBuilder::VTTBuilder(). Definition at line 825 of file DeclCXX.h. Definition at line 829 of file DeclCXX.h. Referenced by addAssociatedClassesAndNamespaces(), CanUseSingleInheritance(), getTypeInfoLinkage(), getVisibleConversionFunctions(), HandleConstructorCall(), isInterfaceLike(), isLayoutCompatibleStruct(), LeastDerivedClassWithSameLayout(), and usesMultipleInheritanceModel(). Definition at line 830 of file DeclCXX.h. Definition at line 831 of file DeclCXX.h. Referenced by addAssociatedClassesAndNamespaces(), and getVisibleConversionFunctions(). Definition at line 832 of file DeclCXX.h. Calculate what the inheritance model would be for this class. Definition at line 157 of file MicrosoftCXXABI.cpp. Definition at line 1247 of file DeclCXX.h. Referenced by adjustCVQualifiersForCXXThisWithinLambda(), and clang::AnalysisDeclContext::getSelfDecl(). Definition at line 1251 of file DeclCXX.h. Referenced by getAccessFlag(), clang::ento::getVariableName(), and HandleConstructorCall(). Definition at line 1255 of file DeclCXX.h. Referenced by getAccessFlag(), and HandleConstructorCall(). Definition at line 1979 of file DeclCXX.h. Definition at line 1980 of file DeclCXX.h. Referenced by clang::ASTDeclWriter::VisitEnumDecl(), and clang::ASTDeclWriter::VisitRecordDecl(). Indicates that the definition of this class is now complete. Definition at line 1803 of file DeclCXX.cpp. Indicates that the definition of this class is now complete, and provides a final overrider map to help determine. FinalOverriders The final overrider map for this class, which can be provided as an optimization for abstract-class checking. If NULL, final overriders will be computed if they are needed to complete the definition. Definition at line 1807 of file DeclCXX.cpp. References clang::RecordDecl::completeDefinition(), conversion_begin(), conversion_end(), getFinalOverriders(), and mayBeAbstract(). Definition at line 1262 of file DeclCXX.h. Referenced by completeDefinition(), isInterfaceLike(), and LookupDirect(). Definition at line 1266 of file DeclCXX.h. Definition at line 123 of file DeclCXX.cpp. References clang::C, CXXRecordDecl(), clang::ASTContext::getLangOpts(), and clang::ASTContext::getTypeDeclType(). Referenced by clang::Sema::CreateCapturedStmtRecordDecl(), clang::Sema::DeclareGlobalNewDelete(), and clang::TemplateDeclInstantiator::InstantiateEnumDefinition(). Definition at line 156 of file DeclCXX.cpp. References clang::C, CXXRecordDecl(), and clang::TTK_Struct. Definition at line 139 of file DeclCXX.cpp. References clang::C, CXXRecordDecl(), clang::ASTContext::getTypeDeclType(), and clang::TTK_Class. Definition at line 886 of file DeclCXX.h. Definition at line 890 of file DeclCXX.h. Definition at line 884 of file DeclCXX.h. Referenced by canPassInRegisters(), findConstructorForByValueReturn(), findTrivialSpecialMember(), findUserDeclaredCtor(), and clang::Sema::ShouldDeleteSpecialMember(). true if a defaulted copy constructor for this class would be deleted. Definition at line 911 of file DeclCXX.h. Determine whether a defaulted default constructor for this class would be constexpr. Definition at line 1385 of file DeclCXX.h. true if a defaulted destructor for this class would be deleted. Definition at line 928 of file DeclCXX.h. true if a defaulted move constructor for this class would be deleted. Definition at line 920 of file DeclCXX.h. Base-class lookup callback that determines whether the given base class specifier refers to a specific class declaration. This callback can be used with lookupInBases() to determine whether a given derived class has is a base class subobject of a particular type. The base record pointer should refer to the canonical CXXRecordDecl of the base class that we are searching for. Definition at line 396 of file CXXInheritance.cpp. References clang::Type::castAs(), getCanonicalDecl(), and clang::CXXBaseSpecifier::getType(). Base-class lookup callback that determines whether there exists a member with the given name that can be used in a nested-name-specifier. This callback can be used with lookupInBases() to find members of the given name within a C++ class hierarchy that can occur within nested-name-specifiers. Definition at line 505 of file CXXInheritance.cpp. References clang::Type::castAs(), clang::CXXBasePath::Decls, clang::DeclContextLookupResult::empty(), clang::DeclContextLookupResult::front(), clang::CXXBaseSpecifier::getType(), clang::DeclContext::lookup(), and clang::DeclContextLookupResult::slice(). Base-class lookup callback that determines whether there exists an OpenMP declare mapper member with the given name. This callback can be used with lookupInBases() to find members of the given name within a C++ class hierarchy. Definition at line 489 of file CXXInheritance.cpp. References clang::Type::castAs(), clang::CXXBasePath::Decls, clang::DeclContextLookupResult::empty(), FindNestedNameSpecifierMember(), clang::DeclContextLookupResult::front(), clang::CXXBaseSpecifier::getType(), clang::DeclContext::lookup(), and clang::DeclContextLookupResult::slice(). Base-class lookup callback that determines whether there exists an OpenMP declare reduction member with the given name. Definition at line 474 of file CXXInheritance.cpp. Base-class lookup callback that determines whether there exists a member with the given name. Definition at line 445 of file CXXInheritance.cpp. References clang::Type::castAs(), findOrdinaryMember(), and clang::CXXBaseSpecifier::getType(). This callback can be used with lookupInBases() to find members of the given name within a C++ class hierarchy, including dependent classes. Definition at line 453 of file CXXInheritance.cpp. References findOrdinaryMember(), clang::Type::getAs(), clang::TemplateSpecializationType::getTemplateName(), and clang::CXXBaseSpecifier::getType(). Base-class lookup callback that determines whether there exists a tag with the given name. This callback can be used with lookupInBases() to find tag members of the given name within a C++ class hierarchy. Definition at line 415 of file CXXInheritance.cpp. Base-class lookup callback that determines whether the given base class specifier refers to a specific class declaration and describes virtual derivation. This callback can be used with lookupInBases() to determine whether a given derived class has is a virtual base class subobject of a particular type. The base record pointer should refer to the canonical CXXRecordDecl of the base class that we are searching for. Definition at line 405 of file CXXInheritance.cpp. References clang::Type::castAs(), getCanonicalDecl(), clang::CXXBaseSpecifier::getType(), and clang::CXXBaseSpecifier::isVirtual(). Indicates that the declaration of a defaulted or deleted special member function is now complete. Definition at line 1295 of file DeclCXX.cpp. References clang::AS_public, clang::Decl::getAccess(), clang::CXXMethodDecl::isCopyAssignmentOperator(), clang::FunctionDecl::isDeleted(), clang::Decl::isImplicit(), clang::CXXMethodDecl::isMoveAssignmentOperator(), clang::FunctionDecl::isTrivial(), and clang::CXXMethodDecl::isUserProvided(). Determines if the given callback holds for all the direct or indirect base classes of this type. The class itself does not count as a base class. This routine returns false if the class has non-computable base classes. BaseMatches Callback invoked for each (direct or indirect) base class of this type, or if AllowShortCircuit is true then until a call returns false. AllowShortCircuit if false, forces the callback to be called for every base class, even if a dependent or non-matching base was found. Definition at line 150 of file CXXInheritance.cpp. References bases(), clang::Type::getAs(), clang::RecordType::getDecl(), clang::RecordDecl::getDefinition(), isCurrentInstantiation(), and clang::DeclContext::isDependentContext(). Referenced by hasAnyDependentBases(), isOrIsDerivedFromSpecializationOf(), isProvablyNotDerivedFrom(), and isTriviallyCopyable(). Definition at line 239 of file DeclFriend.h. Definition at line 243 of file DeclFriend.h. Definition at line 247 of file DeclFriend.h. Definition at line 727 of file DeclCXX.h. Referenced by clang::Sema::CheckBaseSpecifier(), checkMoveAssignmentForRepeatedMove(), clang::Sema::CheckQualifiedMemberReference(), ClassifyImplicitMemberAccess(), FindBaseClass(), clang::Sema::InheritedConstructorInfo::findConstructorForBase(), clang::ClassTemplateDecl::findPartialSpecInstantiatedFromMember(), FindVirtualBaseClass(), getBaseIndex(), clang::CXXMethodDecl::getCorrespondingMethodInClass(), clang::ComparisonCategoryInfo::ValueInfo::getIntValue(), HandleBaseToDerivedCast(), HandleMemberPointerAccess(), clang::Sema::InstantiateClassTemplateSpecialization(), isDerivedFrom(), IsDerivedFromInclusive(), isInstantiationOf(), isProvablyNotDerivedFrom(), clang::CXXMethodDecl::isStatic(), isTriviallyCopyable(), isValidBaseClass(), isVirtuallyDerivedFrom(), clang::ComparisonCategories::lookupInfo(), clang::Sema::MarkVTableUsed(), clang::ASTDeclReader::mergeRedeclarable(), regionMatchesCXXRecordType(), clang::OverridingMethods::replaceAll(), clang::FunctionCallFilterCCC::ValidateCandidate(), clang::ASTDeclReader::VisitCXXRecordDeclImpl(), clang::ASTTypeWriter::VisitTagType(), and clang::ASTDeclReader::VisitUnresolvedUsingTypenameDecl(). Definition at line 731 of file DeclCXX.h. For a closure type, retrieve the mapping from captured variables and this to the non-static data members that store the values or references of the captures. Captures Will be populated with the mapping from captured variables to the corresponding fields. ThisCapture Will be set to the field declaration for the this capture. No entries will be added for init-captures, as they do not capture variables. Definition at line 1404 of file DeclCXX.cpp. Referenced by clang::CodeGen::CodeGenFunction::StartFunction(), and clang::ento::ExprEngine::VisitCommonDeclRefExpr(). Definition at line 768 of file DeclCXX.h. Referenced by CanDeclareSpecialMemberFunction(), clang::Sema::DefineUsedVTables(), DiagnoseReinterpretUpDownCast(), getContainedDynamicClass(), clang::ASTContext::getCurrentKeyFunction(), getODRHash(), clang::ASTNodeImporter::ImportImplicitMethods(), clang::Sema::InstantiateClass(), clang::Sema::InstantiateClassMembers(), clang::Sema::LookupSpecialMember(), and clang::ASTNodeImporter::VisitClassTemplateSpecializationDecl(). Every class template is represented as a ClassTemplateDecl and a CXXRecordDecl. The former contains template properties (such as the template parameter lists) while the latter contains the actual description of the template's contents. ClassTemplateDecl::getTemplatedDecl() retrieves the CXXRecordDecl that from a ClassTemplateDecl, while getDescribedClassTemplate() retrieves the ClassTemplateDecl from a CXXRecordDecl. Definition at line 1629 of file DeclCXX.cpp. Referenced by clang::Sema::ActOnReenterTemplateScope(), clang::ODRHash::AddCXXRecordDecl(), and clang::ASTDeclWriter::VisitCXXRecordDecl(). Returns the destructor decl for this class. Definition at line 1707 of file DeclCXX.cpp. Referenced by clang::Sema::ActOnCXXDelete(), canPassInRegisters(), clang::Sema::canThrow(), clang::Sema::CheckCompletedCXXClass(), decomposeTypeForEH(), clang::CodeGen::CodeGenFunction::emitAutoVarTypeCleanup(), EmitDeclDestroy(), EmitDestroyingObjectDelete(), EmitObjectDelete(), findTrivialSpecialMember(), clang::CXXMethodDecl::getCorrespondingMethodInClass(), clang::CFGImplicitDtor::getDestructorDecl(), getThrowFn(), HasTrivialDestructorBody(), isAnyDestructorNoReturn(), clang::Sema::LookupSpecialMember(), clang::ento::ExprEngine::ProcessDeleteDtor(), clang::CodeGen::CodeGenFunction::PushDestructorCleanup(), and clang::CodeGen::CodeGenModule::TryEmitBaseDestructorAsAlias(). Retrieve the final overriders for each virtual member function in the class hierarchy where this class is the most-derived class in the class hierarchy. Definition at line 731 of file CXXInheritance.cpp. Referenced by completeDefinition(), clang::Sema::DiagnoseAbstractType(), and clang::Sema::MarkVirtualMembersReferenced(). Retrieve the generic lambda's template parameter list. Returns null if the class does not represent a lambda or a generic lambda. Definition at line 1423 of file DeclCXX.cpp. References clang::FunctionDecl::getDescribedFunctionTemplate(), getLambdaCallOperator(), and isLambda(). Get the indirect primary bases for this class. Definition at line 792 of file CXXInheritance.cpp. If this record is an instantiation of a member class, retrieves the member class from which it was instantiated. The declaration for X<int>::A is a (non-templated) CXXRecordDecl whose parent is the class template specialization X<int>. For this declaration, getInstantiatedFromMemberClass() will return the CXXRecordDecl X<T>::A. When a complete definition of X<int>::A is required, it will be instantiated from the declaration returned by getInstantiatedFromMemberClass(). Definition at line 1608 of file DeclCXX.cpp. Referenced by clang::Sema::ActOnExplicitInstantiation(), getDeclContextForTemplateInstationPattern(), getExplicitVisibilityAux(), getTemplateInstantiationPattern(), clang::Sema::InstantiateClass(), clang::Sema::InstantiateClassMembers(), and isInstantiationOf(). Retrieve the lambda call operator of the closure type if this is a closure type. Definition at line 1372 of file DeclCXX.cpp. Referenced by adjustCVQualifiersForCXXThisWithinLambda(), clang::Sema::DeduceReturnType(), clang::CodeGen::CodeGenFunction::EmitLambdaBlockInvokeBody(), clang::CodeGen::CodeGenFunction::EmitLambdaDelegatingInvokeBody(), clang::LambdaExpr::getCallOperator(), getGenericLambdaTemplateParameterList(), clang::BlockCall::getRuntimeDefinition(), and HandleConstructorCall(). Definition at line 1224 of file DeclCXX.h. Referenced by lambdaIsDefaultConstructibleAndAssignable(), and clang::CodeGen::CodeGenFunction::StartFunction(). Retrieve the declaration that provides additional context for a lambda, when the normal declaration context is not specific enough. Certain contexts (default arguments of in-class function parameters and the initializers of data members) have separate name mangling rules for lambdas within the Itanium C++ ABI. For these cases, this routine provides the declaration in which the lambda occurs, e.g., the function parameter or the non-static data member. Otherwise, it returns NULL to imply that the declaration context suffices. Definition at line 1431 of file DeclCXX.cpp. References clang::ASTContext::getExternalSource(), clang::DeclContext::getParentASTContext(), and isLambda(). Referenced by clang::ASTRecordWriter::AddCXXDefinitionData(), clang::LinkageComputer::computeLVForDecl(), and isTemplate(). If this is the closure type of a lambda expression, retrieve the number to be used for name mangling in the Itanium C++ ABI. Zero indicates that this closure type has internal linkage, so the mangling number does not matter, while a non-zero value indicates which lambda expression this is in this particular context. Definition at line 1911 of file DeclCXX.h. Referenced by clang::LinkageComputer::computeLVForDecl(), and isTemplate(). Retrieve the lambda static invoker, the address of which is returned by the conversion operator, and the body of which is forwarded to the lambda call operator. Definition at line 1389 of file DeclCXX.cpp. Definition at line 1971 of file DeclCXX.h. If this class is an instantiation of a member class of a class template specialization, retrieves the member specialization information. Definition at line 1615 of file DeclCXX.cpp. Referenced by getInstantiatedFromMemberClass(), getTemplateInstantiationPattern(), getTemplateSpecializationKind(), clang::Sema::InstantiateClass(), setTemplateSpecializationKind(), and clang::ASTDeclWriter::VisitCXXRecordDecl(). Definition at line 744 of file DeclCXX.h. Definition at line 749 of file DeclCXX.h. Definition at line 753 of file DeclCXX.h. Referenced by assignInheritanceModel(), clang::MemberPointerType::getMostRecentCXXRecordDecl(), and clang::Type::isIncompleteType(). Definition at line 764 of file DeclCXX.h. Returns the inheritance model used for this record. Definition at line 168 of file MicrosoftCXXABI.cpp. Referenced by getMSMemberPointerSlots(), and hasDefaultSetterName(). Controls when vtordisps will be emitted if this record is used as a virtual base. Definition at line 174 of file MicrosoftCXXABI.cpp. Retrieves the number of base classes of this class. Definition at line 816 of file DeclCXX.h. Referenced by clang::ODRHash::AddCXXRecordDecl(), CanUseSingleInheritance(), clang::Sema::CheckConstexprFunctionBody(), checkMoveAssignmentForRepeatedMove(), ComputeVMIClassTypeInfoFlags(), clang::CodeGen::CodeGenModule::getMostBaseClasses(), getTypeInfoLinkage(), HandleConstructorCall(), isInterfaceLike(), isLayoutCompatibleStruct(), isTriviallyCopyable(), LeastDerivedClassWithSameLayout(), and usesMultipleInheritanceModel(). Retrieves the number of virtual base classes of this class. Definition at line 837 of file DeclCXX.h. Referenced by clang::CodeGen::CodeGenTypes::arrangeMSCtorClosure(), clang::CodeGen::CGCXXABI::buildThisParam(), clang::Sema::CheckConstexprFunctionBody(), clang::Sema::CheckConstexprFunctionDecl(), checkMoveAssignmentForRepeatedMove(), decomposeTypeForEH(), defaultedSpecialMemberIsConstexpr(), detectAmbiguousBases(), clang::CodeGen::CodeGenFunction::EmitCtorPrologue(), clang::CodeGen::CodeGenFunction::EnterDtorCleanups(), clang::CodeGen::CodeGenVTables::GenerateClassData(), clang::CodeGen::CodeGenVTables::GetAddrOfVTT(), getCodegenToUse(), HandleConstructorCall(), hasDefaultCXXMethodCC(), clang::CodeGen::CodeGenFunction::InitializeVTablePointers(), clang::CodeGen::CodeGenFunction::IsConstructorDelegationValid(), isInterfaceLike(), isVirtualDirectBase(), LeastDerivedClassWithSameLayout(), clang::Sema::MarkVirtualMembersReferenced(), clang::CodeGen::CodeGenModule::TryEmitBaseDestructorAsAlias(), and clang::VTTBuilder::VTTBuilder(). Definition at line 474 of file DeclCXX.cpp. References clang::ODRHash::AddCXXRecordDecl(), clang::ODRHash::CalculateHash(), getDefinition(), hasDefinition(), hasSimpleCopyConstructor(), hasSimpleDestructor(), hasSimpleMoveAssignment(), and hasSimpleMoveConstructor(). Referenced by clang::ASTRecordWriter::AddCXXDefinitionData(), and clang::ASTDeclReader::VisitUnresolvedUsingTypenameDecl(). Definition at line 735 of file DeclCXX.h. Referenced by clang::ASTContext::getInjectedClassNameType(), getMostRecentNonInjectedDecl(), and clang::ASTDeclWriter::VisitClassTemplatePartialSpecializationDecl(). Definition at line 740 of file DeclCXX.h. Retrieve the record declaration from which this record could be instantiated. Returns null if this class is not a template instantiation. Definition at line 1662 of file DeclCXX.cpp. References getInstantiatedFromMemberClass(), getMemberSpecializationInfo(), getTemplateSpecializationKind(), and clang::isTemplateInstantiation(). Referenced by getDeclContextForTemplateInstationPattern(), getDefiningModule(), clang::CXXMethodDecl::hasInlineBody(), and clang::Sema::InstantiateClassMembers(). Definition at line 1632 of file DeclCXX.h. Determine whether this particular class is a specialization or instantiation of a class template or member class of a class template, and how it was instantiated or specialized. Definition at line 1637 of file DeclCXX.cpp. Referenced by clang::Sema::checkIllFormedTrivialABIStruct(), computeKeyFunction(), clang::Sema::DefineUsedVTables(), getTemplateInstantiationPattern(), clang::if(), isDefinedInClangModule(), clang::CodeGen::CodeGenVTables::isVTableExternal(), ReferenceDllExportedMembers(), clang::Sema::usesPartialOrExplicitSpecialization(), and clang::ASTNodeImporter::VisitClassTemplateSpecializationDecl(). Get all conversion functions visible in current class, including conversion function templates. getVisibleConversionFunctions - get all conversion functions visible in current class; including conversion function templates. Definition at line 1565 of file DeclCXX.cpp. References bases_begin(), bases_end(), clang::ASTUnresolvedSet::begin(), CollectVisibleConversions(), clang::ASTUnresolvedSet::end(), and clang::Decl::getASTContext(). Referenced by ResolveConstructorOverload(), TryRefInitWithConversionFunction(), and TryUserDefinedConversion(). Determine whether this class has any dependent base classes which are not the current instantiation. Definition at line 525 of file DeclCXX.cpp. Determine whether this class has a constexpr default constructor. Definition at line 1391 of file DeclCXX.h. Determine whether this class has at least one constexpr constructor other than the copy or move constructors. Definition at line 1377 of file DeclCXX.h. Determine whether this class has a copy assignment operator with a parameter type which is a reference to a const-qualified type or is not a reference. Definition at line 1130 of file DeclCXX.h. Determine whether this class has a copy constructor with a parameter type which is a reference to a const-qualified type. Definition at line 1030 of file DeclCXX.h. Determine whether this class has any default constructors. Definition at line 964 of file DeclCXX.h. Referenced by TryConstructorInitialization(), and TryListInitialization(). Definition at line 775 of file DeclCXX.h. References clang::C, clang::Create(), and Id. Referenced by clang::ODRHash::AddCXXRecordDecl(), CanUseSingleInheritance(), EmitObjectDelete(), clang::Sema::getFixItZeroInitializerForType(), getODRHash(), getTypeInfoLinkage(), isCLike(), IsDerivedFromInclusive(), isInterfaceLike(), clang::CodeGen::CodeGenFunction::isVptrCheckRequired(), shouldOmitDefinition(), and warnAboutAmbiguousFunction(). Determine whether this class has direct non-static data members. Definition at line 1329 of file DeclCXX.h. Determines whether this record has any friends. Definition at line 905 of file DeclCXX.h. Whether this class has any in-class initializers for non-static data members (including those in anonymous unions or structs). Definition at line 1288 of file DeclCXX.h. Referenced by defaultedSpecialMemberIsConstexpr(), and findDefaultInitializer(). Determine whether this class has a using-declaration that names a base class assignment operator. Definition at line 1531 of file DeclCXX.h. Determine whether this class has a using-declaration that names a user-declared base class constructor. Definition at line 1525 of file DeclCXX.h. Determine whether this class has a destructor which has no semantic effect. Any such destructor will be trivial, public, defaulted and not deleted, and will call only irrelevant destructors. Definition at line 1513 of file DeclCXX.h. Referenced by clang::Sema::ActOnCXXDelete(), clang::Sema::CheckCXXThrowOperand(), and clang::Sema::FinalizeVarWithDestructor(). Determine whether this class has a move assignment operator. Definition at line 1143 of file DeclCXX.h. Determine whether this class has a move constructor. Definition at line 1053 of file DeclCXX.h. Determine whether this class, or any of its class subobjects, contains a mutable field. Definition at line 1355 of file DeclCXX.h. Referenced by diagnoseUnreadableFields(), and clang::CXXInstanceCall::getExtraInvalidatedValues(). Determine whether this class has a non-literal or/ volatile type non-static data member or base class. Definition at line 1519 of file DeclCXX.h. Definition at line 1455 of file DeclCXX.h. Referenced by EvaluateUnaryTypeTrait(), and isTriviallyCopyable(). Definition at line 1409 of file DeclCXX.h. Definition at line 1414 of file DeclCXX.h. Determine whether this class has a non-trivial default constructor (C++11 [class.ctor]p5). Definition at line 1369 of file DeclCXX.h. Definition at line 1487 of file DeclCXX.h. Definition at line 1491 of file DeclCXX.h. Definition at line 1469 of file DeclCXX.h. Referenced by checkMoveAssignmentForRepeatedMove(), EvaluateUnaryTypeTrait(), and isTriviallyCopyable(). Definition at line 1434 of file DeclCXX.h. Definition at line 1440 of file DeclCXX.h. true if we know for sure that this class has a single, accessible, unambiguous copy constructor that is not deleted. Definition at line 937 of file DeclCXX.h. true if we know for sure that this class has an accessible destructor that is not deleted. Definition at line 958 of file DeclCXX.h. true if we know for sure that this class has a single, accessible, unambiguous move assignment operator that is not deleted. Definition at line 951 of file DeclCXX.h. true if we know for sure that this class has a single, accessible, unambiguous move constructor that is not deleted. Definition at line 944 of file DeclCXX.h. Definition at line 1449 of file DeclCXX.h. Referenced by clang::CodeGen::CodeGenFunction::EmitAggregateCopy(), EvaluateUnaryTypeTrait(), and findTrivialSpecialMember(). Definition at line 1399 of file DeclCXX.h. Referenced by canPassInRegisters(), clang::CodeGen::CodeGenFunction::EmitAggregateCopy(), and findTrivialSpecialMember(). Definition at line 1403 of file DeclCXX.h. Referenced by canPassInRegisters(), and findTrivialSpecialMember(). Determine whether this class has a trivial default constructor (C++11 [class.ctor]p5). Definition at line 1362 of file DeclCXX.h. Definition at line 1477 of file DeclCXX.h. Referenced by clang::ento::ExprEngine::bindReturnValue(), EmitBaseInitializer(), clang::CodeGen::CodeGenFunction::EmitCXXConstructLValue(), EmitDeclDestroy(), EmitObjectDelete(), clang::CodeGen::CodeGenFunction::EnterDtorCleanups(), findTrivialSpecialMember(), getThrowFn(), hasNontrivialDestruction(), HasTrivialDestructorBody(), clang::Expr::isConstantInitializer(), clang::ConstructionContextLayer::isStrictlyMoreSpecificThan(), isTriviallyCopyable(), clang::CodeGen::CodeGenModule::maybeSetTrivialComdat(), and clang::CodeGen::CodeGenFunction::PushDestructorCleanup(). Definition at line 1481 of file DeclCXX.h. Definition at line 1462 of file DeclCXX.h. Referenced by checkMoveAssignmentForRepeatedMove(), clang::CodeGen::CodeGenFunction::EmitAggregateCopy(), and EvaluateUnaryTypeTrait(). Definition at line 1422 of file DeclCXX.h. Definition at line 1427 of file DeclCXX.h. Whether this class or any of its subobjects has any members of reference type which would make value-initialization ill-formed. if T is a non-union class type without a user-declared constructor, then every non-static data member and base-class component of T is value-initialized [...] A program that calls for [...] value-initialization of an entity of reference type is ill-formed. Definition at line 1298 of file DeclCXX.h. Determine whether this class has any user-declared constructors. When true, a default constructor will not be implicitly declared. Definition at line 982 of file DeclCXX.h. Referenced by CheckAggExprForMemSetUse(), clang::Sema::CheckCompletedCXXClass(), isInterfaceLike(), and RequiresVtordisp(). Determine whether this class has a user-declared copy assignment operator. When false, a copy assignment operator will be implicitly declared. Definition at line 1105 of file DeclCXX.h. Determine whether this class has a user-declared copy constructor. When false, a copy constructor will be implicitly declared. Definition at line 995 of file DeclCXX.h. Determine whether this class has a user-declared destructor. When false, a destructor will be implicitly declared. Definition at line 1178 of file DeclCXX.h. Referenced by isInterfaceLike(), and RequiresVtordisp(). Determine whether this class has had a move assignment declared by the user. Definition at line 1138 of file DeclCXX.h. Determine whether this class has had a move constructor declared by the user. Definition at line 1048 of file DeclCXX.h. Whether this class has a user-declared move constructor or assignment operator. When false, a move constructor and assignment operator may be implicitly declared. Definition at line 1041 of file DeclCXX.h. Whether this class has a user-provided default constructor per C++11. Definition at line 988 of file DeclCXX.h. Referenced by clang::Sema::getFixItZeroInitializerForType(), and warnAboutAmbiguousFunction(). Determine whether this class has any variant members. Definition at line 1358 of file DeclCXX.h. Referenced by CheckConstexprCtorInitializer(), clang::Sema::CheckConstexprFunctionBody(), and defaultedSpecialMemberIsConstexpr(). Determine whether an implicit copy assignment operator for this type would have a parameter with a const-qualified reference type. Definition at line 1123 of file DeclCXX.h. Determine whether an implicit copy constructor for this type would have a parameter with a const-qualified reference type. Definition at line 1022 of file DeclCXX.h. Determine whether this class has a pure virtual function. The class is is abstract per (C++ [class.abstract]p2) if it declares a pure virtual function or inherits a pure virtual function that is not overridden. Definition at line 1343 of file DeclCXX.h. Referenced by clang::Sema::CheckCompletedCXXClass(), clang::Sema::CheckVirtualDtorCall(), clang::CodeGen::CodeGenFunction::EmitCtorPrologue(), clang::CodeGen::CodeGenFunction::EmitDestructorBody(), evaluateTypeTrait(), getBadTypeidFn(), and clang::Sema::inferCUDATargetForImplicitSpecialMember(). Determine whether this class is an aggregate (C++ [dcl.init.aggr]), which is a class with no user-declared constructors, no private or protected non-static data members, no base classes, and no virtual functions (C++ [dcl.init.aggr]p1). Definition at line 1283 of file DeclCXX.h. Referenced by clang::Sema::CheckCompletedCXXClass(), and clang::Sema::getFixItZeroInitializerForType(). Returns true if the class destructor, or any implicitly invoked destructors are marked noreturn. Definition at line 1720 of file DeclCXX.cpp. References bases(), clang::RecordDecl::fields(), and getDestructor(). True if this class is C-like, without C++-specific features, e.g. it contains only public fields, no bases, tag kind is not 'class', etc. Definition at line 1348 of file DeclCXX.cpp. References clang::TagDecl::getTagKind(), hasDefinition(), isPOD(), clang::TTK_Class, and clang::TTK_Interface. Determine whether this dependent class is a current instantiation, when viewed from within the given context. Definition at line 140 of file CXXInheritance.cpp. References clang::DeclContext::Equals(), clang::DeclContext::getParent(), and clang::DeclContext::isFileContext(). Referenced by forallBases(), and getCurrentInstantiationOf(). Determine whether this class was standard-layout per C++11 [class]p7, specifically using the C++11 rules without any DRs. Definition at line 1351 of file DeclCXX.h. Determine whether this lambda expression was known to be dependent at the time it was created, even if its context does not appear to be dependent. This flag is a workaround for an issue with parsing, where default arguments are parsed before their enclosing function declarations have been created. This means that any lambda expressions within those default arguments will have as their DeclContext the context enclosing the function declaration, which may be non-dependent even when the function declaration itself is dependent. This flag indicates when we know that the lambda is dependent despite that. Definition at line 1967 of file DeclCXX.h. This routine only determines whether this class is derived from Base, but does not account for factors that may make a Derived -> Base class ill-formed, such as private/protected inheritance or multiple, ambiguous base class subobjects. Base the base class we are searching for. true if this class is derived from Base, false otherwise. Definition at line 91 of file CXXInheritance.cpp. Referenced by DiagnoseReinterpretUpDownCast(), clang::Sema::IsDerivedFrom(), and clang::FunctionCallFilterCCC::ValidateCandidate(). Determine whether this class is derived from the type Base. Paths will contain the paths taken from the current class to the given Base class. Definition at line 97 of file CXXInheritance.cpp. References getCanonicalDecl(), getCanonicalDecl(), clang::CXXBasePaths::setOrigin(), and Specifier. Definition at line 788 of file DeclCXX.h. Referenced by CanSkipVTablePointerInitialization(), CanUseSingleInheritance(), clang::CodeGen::CGDebugInfo::completeUnusedClass(), clang::ASTContext::DeclMustBeEmitted(), clang::CodeGen::CodeGenFunction::EmitCXXConstructorCall(), clang::CodeGen::CodeGenFunction::emitImplicitAssignmentOperatorBody(), clang::CodeGen::CodeGenFunction::EmitVTablePtrCheckForCast(), getContainedDynamicClass(), getTypeInfoLinkage(), clang::CodeGen::CodeGenFunction::getVTablePointers(), clang::CodeGen::CodeGenFunction::InitializeVTablePointers(), clang::Sema::isEmptyCudaConstructor(), clang::Sema::isEmptyCudaDestructor(), isFunctionLocalClass(), clang::CodeGen::CodeGenFunction::isVptrCheckRequired(), clang::CodeGen::CodeGenVTables::isVTableExternal(), clang::Sema::MarkVTableUsed(), shouldOmitDefinition(), vfptrIsEarlierInMDC(), and clang::VTTBuilder::VTTBuilder(). Determine whether this is an empty class in the sense of (C++11 [meta.unary.prop]). 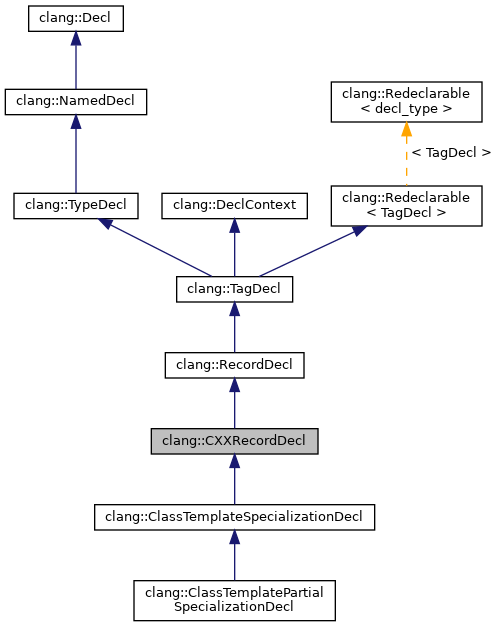 The CXXRecordDecl is a class type, but not a union type, with no non-static data members other than bit-fields of length 0, no virtual member functions, no virtual base classes, and no base class B for which is_empty<B>::value is false. This does NOT include a check for union-ness. Definition at line 1326 of file DeclCXX.h. Referenced by CanUseSingleInheritance(), CheckConstexprCtorInitializer(), clang::ento::ExprEngine::CreateCXXTemporaryObject(), clang::CodeGen::CodeGenFunction::EmitAggregateCopy(), EmitNullBaseClassInitialization(), EmitNullConstant(), hasFields(), isReadByLvalueToRvalueConversion(), recordUsesEBO(), roundUpSizeToCharAlignment(), and warnAboutAmbiguousFunction(). Determine whether this class describes a generic lambda function object (i.e. function call operator is a template). Definition at line 1358 of file DeclCXX.cpp. Referenced by clang::Sema::BuildLambdaExpr(), clang::Sema::DefineImplicitLambdaToBlockPointerConversion(), clang::CodeGen::CodeGenFunction::EmitLambdaBlockInvokeBody(), clang::CodeGen::CodeGenFunction::EmitLambdaDelegatingInvokeBody(), HandleConstructorCall(), clang::isGenericLambdaCallOperatorSpecialization(), and clang::CXXMethodDecl::isLambdaStaticInvoker(). Definition at line 1752 of file DeclCXX.cpp. References clang::AS_public, bases_begin(), conversion_begin(), conversion_end(), clang::RecordDecl::field_empty(), clang::Decl::getDeclContext(), clang::NamedDecl::getName(), getNumBases(), getNumVBases(), hasDefinition(), hasFriends(), hasUserDeclaredConstructor(), hasUserDeclaredDestructor(), isDeclContextInNamespace(), clang::DeclContext::isExternCContext(), clang::TagDecl::isInterface(), isLambda(), clang::TagDecl::isStruct(), and methods(). Definition at line 1195 of file DeclCXX.h. Referenced by clang::Sema::CheckCompletedCXXClass(), compareConversionFunctions(), getAccessFlag(), getGenericLambdaTemplateParameterList(), getLambdaCallOperator(), getLambdaContextDecl(), getLambdaStaticInvoker(), getOutermostEnclosingLambda(), clang::AnalysisDeclContext::getSelfDecl(), IsDerivedFromInclusive(), isGenericLambda(), isInterfaceLike(), clang::isLambdaCallOperator(), clang::isLambdaConversionOperator(), clang::CXXMethodDecl::isLambdaStaticInvoker(), isTemplate(), lambdaIsDefaultConstructibleAndAssignable(), clang::Sema::ShouldDeleteSpecialMember(), and clang::CodeGen::CodeGenFunction::StartFunction(). Determine whether this class is a literal type. every constructor call and full-expression in the brace-or-equal-intializers for non-static data members (if any) is a constant expression. We resolve DR1361 by ignoring the second bullet. We resolve DR1452 by treating types with trivial default constructors as literal types. Only in C++17 and beyond, are lambdas literal types. Definition at line 1565 of file DeclCXX.h. If the class is a local class [class.local], returns the enclosing function declaration. Definition at line 1646 of file DeclCXX.h. Referenced by clang::Sema::InstantiateClassMembers(), and isLocalClass(). Definition at line 1653 of file DeclCXX.h. Definition at line 806 of file DeclCXX.h. For purposes of this function a class is POD if it is an aggregate that has no non-static non-POD data members, no reference data members, no user-defined copy assignment operator and no user-defined destructor. Note that this is the C++ TR1 definition of POD. Definition at line 1311 of file DeclCXX.h. Referenced by isCLike(), isDeletingDtor(), and mustSkipTailPadding(). Whether this class is polymorphic (C++ [class.virtual]), which means that the class contains or inherits a virtual function. Definition at line 1336 of file DeclCXX.h. Referenced by clang::Sema::BuildCXXTypeId(), clang::Sema::CheckCompletedCXXClass(), clang::Sema::checkIllFormedTrivialABIStruct(), clang::Sema::CheckVirtualDtorCall(), computeKeyFunction(), clang::CodeGen::CodeGenFunction::EnterDtorCleanups(), isDirectVBase(), clang::OverridingMethods::replaceAll(), and usesMultipleInheritanceModel(). Definition at line 132 of file CXXInheritance.cpp. Referenced by clang::Sema::CheckQualifiedMemberReference(), and findDirectBaseWithType(). Determine whether this class is standard-layout per C++ [class]p7. Definition at line 1347 of file DeclCXX.h. Determine whether this class is considered trivial. C++11 [class]p6: "A trivial class is a class that has a trivial default constructor and is trivially copyable." Definition at line 1544 of file DeclCXX.h. Determine whether this class is considered trivially copyable per (C++11 [class]p6). Definition at line 532 of file DeclCXX.cpp. References clang::RecordDecl::fields(), forallBases(), clang::Type::getAsCXXRecordDecl(), clang::ASTContext::getBaseElementType(), getCanonicalDecl(), getNumBases(), hasNonTrivialCopyAssignment(), hasNonTrivialCopyConstructor(), hasNonTrivialMoveAssignment(), hasNonTrivialMoveConstructor(), hasTrivialDestructor(), clang::TagDecl::isUnion(), and X. Determine whether this class is virtually derived from the class Base. This routine only determines whether this class is virtually derived from Base, but does not account for factors that may make a Derived -> Base class ill-formed, such as private/protected inheritance or multiple, ambiguous base class subobjects. true if this class is virtually derived from Base, false otherwise. Definition at line 112 of file CXXInheritance.cpp. Referenced by calculateOffset(), isValidBaseClass(), and lookupInBases(). Determine whether this lambda should have an implicit default constructor and copy and move assignment operators. Definition at line 630 of file DeclCXX.cpp. References clang::ASTUnresolvedSet::addDecl(), clang::Qualifiers::Const, clang::Decl::getASTContext(), clang::Decl::getASTMutationListener(), clang::Decl::getFriendObjectKind(), getLambdaCaptureDefault(), clang::ASTContext::getLangOpts(), clang::Decl::getPreviousDecl(), clang::TagDecl::getTagKind(), clang::TagDecl::isBeingDefined(), clang::Decl::isImplicit(), clang::Decl::isInvalidDecl(), isLambda(), clang::LCD_None, clang::ASTUnresolvedSet::replace(), clang::TTK_Class, and clang::TTK_Interface. Performs an imprecise lookup of a dependent name in this class. This function does not follow strict semantic rules and should be used only when lookup rules can be relaxed, e.g. indexing. Definition at line 523 of file CXXInheritance.cpp. Look for entities within the base classes of this C++ class, transitively searching all base class subobjects. This routine uses the callback function BaseMatches to find base classes meeting some search criteria, walking all base class subobjects and populating the given Paths structure with the paths through the inheritance hierarchy that resulted in a match. On a successful search, the Paths structure can be queried to retrieve the matching paths and to determine if there were any ambiguities. BaseMatches callback function used to determine whether a given base matches the user-defined search criteria. Paths used to record the paths from this class to its base class subobjects that match the search criteria. LookupInDependent can be set to true to extend the search to dependent base classes. true if there exists any path from this class to a base class subobject that matches the search criteria. Definition at line 340 of file CXXInheritance.cpp. References clang::CXXBasePaths::isFindingAmbiguities(), clang::CXXBasePaths::isRecordingPaths(), and isVirtuallyDerivedFrom(). Determine whether this class may end up being abstract, even though it is not yet known to be abstract. true if this class is not known to be abstract but has any base classes that are abstract. In this case, completeDefinition() will need to compute final overriders to determine whether the class is actually abstract. Definition at line 1848 of file DeclCXX.cpp. References bases(), clang::DeclContext::isDependentContext(), and clang::Decl::isInvalidDecl(). true if class is dynamic or might be dynamic because the definition is incomplete of dependent. Definition at line 794 of file DeclCXX.h. true if class is non dynamic or might be non dynamic because the definition is incomplete of dependent. Definition at line 800 of file DeclCXX.h. Calculates the access of a decl that is reached along a path. Definition at line 1871 of file DeclCXX.h. Iterates in the order the methods were declared. Definition at line 870 of file DeclCXX.h. Definition at line 875 of file DeclCXX.h. Definition at line 864 of file DeclCXX.h. Referenced by assumeNoOverflow(), canPassInRegisters(), clang::Sema::checkClassLevelCodeSegAttribute(), computeKeyFunction(), clang::ASTNodeImporter::ImportImplicitMethods(), isClassOrMethodDLLImport(), isInterfaceLike(), LeastDerivedClassWithSameLayout(), clang::Sema::MarkVirtualMemberExceptionSpecsNeeded(), clang::OverridingMethods::replaceAll(), RequiresVtordisp(), clang::Sema::ShouldDeleteSpecialMember(), and clang::ASTNodeImporter::VisitClassTemplateSpecializationDecl(). Determine whether this class needs an implicit copy assignment operator to be lazily declared. Definition at line 1111 of file DeclCXX.h. Referenced by clang::Sema::DeclareImplicitCopyAssignment(), and clang::Sema::ForceDeclarationOfImplicitMembers(). Determine whether this class needs an implicit copy constructor to be lazily declared. Definition at line 1001 of file DeclCXX.h. Referenced by clang::Sema::AddImplicitlyDeclaredMembersToClass(), canPassInRegisters(), clang::Sema::DeclareImplicitCopyConstructor(), clang::Sema::ForceDeclarationOfImplicitMembers(), and clang::Sema::LookupConstructors(). Determine if we need to declare a default constructor for this class. This value is used for lazy creation of default constructors. Definition at line 973 of file DeclCXX.h. Referenced by clang::Sema::AddImplicitlyDeclaredMembersToClass(), clang::Sema::DeclareImplicitDefaultConstructor(), findTrivialSpecialMember(), clang::Sema::ForceDeclarationOfImplicitMembers(), and clang::Sema::LookupConstructors(). Determine whether this class needs an implicit destructor to be lazily declared. Definition at line 1184 of file DeclCXX.h. Referenced by canPassInRegisters(), clang::Sema::DeclareImplicitDestructor(), findTrivialSpecialMember(), clang::Sema::ForceDeclarationOfImplicitMembers(), and clang::Sema::LookupSpecialMember(). Determine whether this class should get an implicit move assignment operator or if any existing special member function inhibits this. Definition at line 1160 of file DeclCXX.h. Referenced by clang::Sema::DeclareImplicitMoveAssignment(), and clang::Sema::ForceDeclarationOfImplicitMembers(). Determine whether this class should get an implicit move constructor or if any existing special member function inhibits this. Definition at line 1087 of file DeclCXX.h. Referenced by canPassInRegisters(), clang::Sema::DeclareImplicitMoveConstructor(), clang::Sema::ForceDeclarationOfImplicitMembers(), and clang::Sema::LookupConstructors(). Determine whether we need to eagerly declare a defaulted copy assignment operator for this class. Definition at line 1117 of file DeclCXX.h. Determine whether we need to eagerly declare a defaulted copy constructor for this class. Definition at line 1007 of file DeclCXX.h. Referenced by clang::Sema::AddImplicitlyDeclaredMembersToClass(), and clang::TextNodeDumper::VisitCXXRecordDecl(). Determine whether we need to eagerly declare a destructor for this class. Definition at line 1190 of file DeclCXX.h. Determine whether we need to eagerly declare a move assignment operator for this class. Definition at line 1171 of file DeclCXX.h. Determine whether we need to eagerly declare a defaulted move constructor for this class. Definition at line 1097 of file DeclCXX.h. In the Microsoft C++ ABI, use zero for the field offset of a null data member pointer if we can guarantee that zero is not a valid field offset, or if the member pointer has multiple fields. Polymorphic classes have a vfptr at offset zero, so we can use zero for null. If there are multiple fields, we can use zero even if it is a valid field offset because null-ness testing will check the other fields. Definition at line 1946 of file DeclCXX.h. Definition at line 251 of file DeclFriend.h. Removes a conversion function from this class. The conversion function must currently be a member of this class. Furthermore, this class must currently be in the process of being defined. Definition at line 1583 of file DeclCXX.cpp. References clang::ASTUnresolvedSet::end(), clang::ASTUnresolvedSet::erase(), clang::Decl::getASTContext(), and clang::ASTUnresolvedSet::size(). Sets the base classes of this struct or class. Definition at line 184 of file DeclCXX.cpp. References clang::RecordDecl::APK_CanNeverPassInRegs, clang::AS_public, clang::C, clang::ASTContext::Deallocate(), clang::CXXBaseSpecifier::getAccessSpecifier(), clang::Type::getAs(), clang::Type::getAsCXXRecordDecl(), clang::Decl::getASTContext(), clang::ASTContext::getCanonicalType(), clang::ASTContext::getLangOpts(), clang::CXXBaseSpecifier::getType(), hasNonLiteralTypeFieldsOrBases(), hasRepeatedBaseClass(), clang::Type::isDependentType(), clang::Type::isLiteralType(), clang::CXXBaseSpecifier::isVirtual(), clang::RecordDecl::setArgPassingRestrictions(), clang::RecordDecl::setHasObjectMember(), and clang::RecordDecl::setHasVolatileMember(). Definition at line 1633 of file DeclCXX.cpp. Definition at line 1495 of file DeclCXX.h. Set that we attempted to declare an implicit copy constructor, but overload resolution failed so we deleted it. Definition at line 1060 of file DeclCXX.h. Set that we attempted to declare an implicit destructor, but overload resolution failed so we deleted it. Definition at line 1078 of file DeclCXX.h. Set that we attempted to declare an implicit move assignment operator, but overload resolution failed so we deleted it. Definition at line 1150 of file DeclCXX.h. Set that we attempted to declare an implicit move constructor, but overload resolution failed so we deleted it. Definition at line 1069 of file DeclCXX.h. Specify that this record is an instantiation of the member class RD. Definition at line 1620 of file DeclCXX.cpp. Definition at line 804 of file DeclCXX.h. Set the mangling number and context declaration for a lambda class. Definition at line 1929 of file DeclCXX.h. Set the kind of specialization or template instantiation this is. Definition at line 1648 of file DeclCXX.cpp. Referenced by clang::Sema::InstantiateClass(), and clang::ASTNodeImporter::VisitClassTemplateSpecializationDecl(). Definition at line 1331 of file DeclCXX.cpp. Definition at line 839 of file DeclCXX.h. Referenced by clang::Sema::CheckConstexprFunctionDecl(), clang::Sema::DefineInheritingConstructor(), DiagnoseBaseOrMemInitializerOrder(), clang::CodeGen::CodeGenFunction::EnterDtorCleanups(), HasTrivialDestructorBody(), clang::Sema::inferCUDATargetForImplicitSpecialMember(), isFunctionLocalClass(), recordUsesEBO(), and RequiresVtordisp(). Definition at line 842 of file DeclCXX.h. Definition at line 846 of file DeclCXX.h. Definition at line 847 of file DeclCXX.h. Definition at line 848 of file DeclCXX.h. Definition at line 849 of file DeclCXX.h. Renders and displays an inheritance diagram for this C++ class and all of its base classes (transitively) using GraphViz. viewInheritance - Display the inheritance hierarchy of this C++ class using GraphViz. Definition at line 136 of file InheritViz.cpp. Definition at line 300 of file DeclCXX.h. Definition at line 301 of file DeclCXX.h. Definition at line 302 of file DeclCXX.h. Definition at line 303 of file DeclCXX.h. Definition at line 304 of file DeclCXX.h. Definition at line 305 of file DeclCXX.h. Definition at line 306 of file DeclCXX.h. Definition at line 307 of file DeclCXX.h.